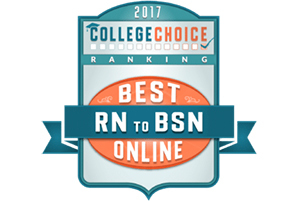 Upper Iowa University has been ranked among the top 30 schools in the nation for Best Online RN to BSN Degrees for 2017. UIU is ranked 29th overall by College Choice, a leading authority in college and university rankings and resources. UIU’s Department of Nursing offers an online, CCNE-accredited RN to BSN that is designed to prepare students for leadership positions within the nursing profession or graduate work. College Choice reported that the carefully balanced UIU curriculum helps nurses integrate theoretical knowledge and evidence-based practice in a collaborative health care delivery environment. Students also learn to manage technology and resources to communicate, support and provide quality care. Upper Iowa University’s online RN to BSN program requires the completion of 35 credit hours of nursing courses. Students have the option of enrolling in the program on a part-time (finishing in 20 months) or full-time (finishing in one year) basis. The eight-week sessions start six times per year. According to College Choice, the UIU ranking is based on program accreditation, national reputation, tuition costs and early career earnings of graduates. The data from the ranking comes from the National Center for Education Statistics’ IPEDS database, U.S. News & World Report, Payscale and individual college websites. For additional information about UIU’s RN to BSN program, visit uiu.edu/academics/undergraduate/nursing-rn-bsn. To learn more about all of UIU’s educational programming and services, go to uiu.edu.